The senior executives at CEIBS Executive MBA programme provided with the relevant tools and frameworks enabling them to excel in the challenging global arena that they are playing in today. With a world-class faculty and classmates from countries across Asia, Europe and the USA, CEIBS students get both a direct exposure to China and the Chinese people, while networking globally and interacting with dynamic and talented executives of leading multinational firms. 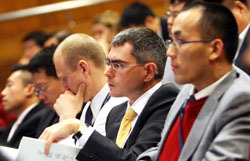 The CEIBS Global Executive MBA is an 18 month, part-time programme. The classes consist of 59 % Chinese nationals and 41% international participants representing 26 different countries and regions. CEIBS was the first Business School in the Chinese mainland to offer an Executive MBA programme, and has today a network of over 6,000 EMBA alumni, from a much diversified background. A minimum of 10 years work experience with at least 7 years in managerial positions. A highly committed organisation that allows you two working days off each month to attend classes; financial sponsorship however not obligatory. The students in the CEIBS EMBA programme are typically experienced Executives, Managers and Entrepreneurs; highly gifted and eager to share their knowledge and perspectives with others. Students receive the MBA degree from CEIBS on completion, which is accredited by the AACSB and the EQUIS. CEIBS EMBA curriculum combines a rigorous pace inclusive of both its "hard" (analytical) and "soft" (leadership) dimensions. Students are required to conduct a group research project that solves a real business problem. Leadership development is not an elective, but a fundamental dimension integrated into the entire curriculum. 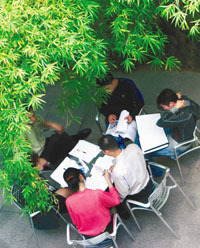 Except for the global modules, most courses are conducted at the Shanghai campus. The class meets 4 days every month (from Thursday morning to Sunday afternoon) for 18 months. Compared with most business schools in China, the CEIBS EMBA programme focuses not only on management theories but also on practical solutions. In the CEIBS EMBA programme, traditional dissertations are not required; rather, a group project with a purpose of solving a real business problem is required. The group project, will be under the direction of faculties of different fields, and participants need to do an oral defense to get their degree. The tuition fee of 2011 EMBA programme is RMB 458,000. For the Global EMBA Programme, an additional fee of RMB 20,000 is charged to cover the incremental costs incurred by two Global Modules. * International students can pay the tuition fee in USD, based on the exchange buying rate on the day of the payment. The CEIBS EMBA programme design is based on the full-time MBA program format, but tailored in its curriculum and schedule to meet the needs of senior executives in China. The programme allows working professionals to pursue an MBA without interrupting their careers. The programme is designed to allow students to share work experience and contribute to the classroom experience, thus learning from each other. Currently, about 60 to 70 per cent of the CEIBS EMBA students are sponsored or partly sponsored by their employers.